Chief rabbi of Paris and of France from 1360 to 1385; son of Joseph b. Johanan of Treves, rabbi of Marseilles; pupil of Perez b. Isaac ha-Kohen and of Nissim b. Reuben of Gerona. In 1360 King Charles V. appointed him chief rabbi of the community of Paris and of all the newly organized communities of France, exempting him and Manecier of Vesoul from wearing the Jewish badge. 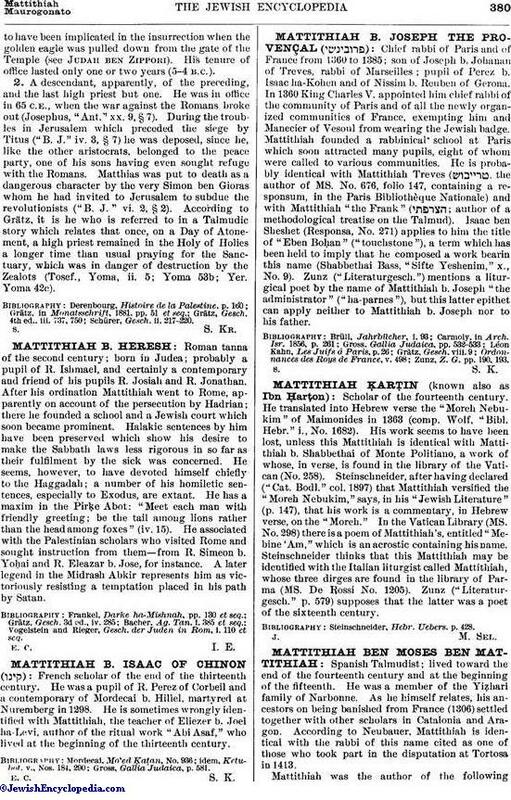 Mattithiah founded a rabbinical school at Paris which soon attracted many pupils, eight of whom were called to various communities. He is probably identical with Mattithiah Treves ( , the author of MS. No. 676, folio 147, containing a responsum, in the Paris Bibliothèque Nationale) and with Mattithiah "the Frank" ( ; author of a methodological treatise on the Talmud). Isaac ben Sheshet (Responsa, No. 271) applies to him the title of "Eben Boḥan" ("touchstone"), a term which has been held to imply that he composed a work bearin this name (Shabbethai Bass, "Sifte Yeshenim," x., No. 9). Zunz ("Literaturgesch.") mentions a liturgical poet by the name of Mattithiah b. Joseph "the administrator" ("ha-parnes"), but this latter epithet can apply neither to Mattithiah b. Joseph nor to his father. Zunz, Z. G. pp. 190, 193.